There are plenty of arguments for and against appropriation in the arts. A lot of these arguments get confusing and blurry when leaving the realm of visual art behind in favor of sound-based work, or when combining visual art and sound-based art. Issues of copyright, musicianship, ownership and more become trickier and more complex for the simple reason that it’s easy to land in front of a judge for doing sound-based appropriation. Why? Commerce. Sound art often finds its way into the same distribution channels as music, and when this happens, legal complications arise that do not necessarily apply when showing visual artwork or even sound-based work in a gallery context. The sound-based artist works at her (legal) peril unless the work is strictly controlled in terms of duplication and distribution. Unfortunately for those of us interested in pursuing this type of work, sound art usually finds a way to be experienced outside the gallery context whether we want it to or not. It’s a double-edged sword that promotes and threatens to destroy the work at the same time. Those who work in sound art (especially with appropriated material) are doomed to repeat history unless they take the time to study case law related to potential legal issues in their work. Sound art legal problems most commonly center around appropriation-a legitimate art practice that has terrifying legal consequences unless the right precautions are taken. Legal precedent around Fair Use, parody, satire, and reportage includes the general notion that satire “excuses” certain types of appropriation. Parody, at least at a certain point in legacy case law around copyright issues, seems to have a greater amount of protection. Satire is protected speech, but there is legal precedent for finding sound artists guilty of copyright infringement because their satire was too broad, poking fun at a larger societal issue rather than directed specifically against the appropriated material. If you work with appropriated audio material, it seems necessary to insure that the work you’re using is directly addressed by satire rather than hoping an audience is sophisticated enough to connect the dots. In my own work, there are several recurring themes including the collision between organized religion, politics, advertising/PR, and sexuality. It is the express purpose of this manifesto to identify a demarcation line between personal beliefs, and the propaganda of organized religion, politics, and corporations. There’s nothing wrong with a personal belief in a product, political party, supreme being or beings, or mass media. The point at which belief or support turns into an issue suitable for parody and satire is when organizations or individuals go on record (literally on vinyl records for my purposes) to influence, convert, evangelize, and condemn on behalf of organizations or belief systems. Personal belief or participation is not the same as an attempt to influence or control. Institutional critique is the heart of my work in sound art. William Burroughs once stated, and I paraphrase, that control only leads to more control. I would add the notions of influence, propaganda, and groupthink to that statement. This is the core of my work in sound in many ways. Can art made by, for, and about consenting adults be “illegal”? What are the consequences of living in a society where such potential exists? Who decides? At what point does sound become the exclusive property of one person or group? What are the ramifications of the physical or digital reproduction of sound with respect to these issues? Is it possible to “own” a digital recording? What does the ownership represent? Are the actual zeros and ones of digital data owned or are we talking about the illusion created by the assemblage of these zeroes and ones in your headphones, your screens, your devices? 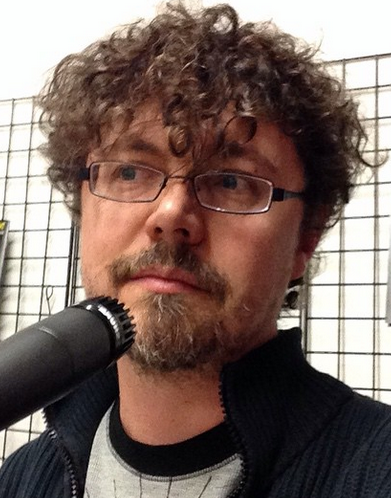 My work in sound is satire, parody, social commentary, and in some cases reportage. In ANY instance where appropriated audio is being used, my direct intent is to satire, parody, and/or comment directly on the source material. The inclusion of the appropriated material should be interpreted directly as commentary, satire, parody and/or reportage. This is not simply a statement intended to absolve my work of copyright issues, it is a sincere expression of intent as well as an instruction to the listener as to how the work should be interpreted. Telling people how to interpret one’s art is generally considered “not done” in the art world. But in these litigious times, those who work with appropriated material may feel forced, as I do, to direct attention to specific investigation of the material appropriated. I am lucky enough to have a neighborhood record store, Laurie’s Planet Of Sound. In Chicago, there are lots of neighborhoods with at least one shop nearby, but even after more than a decade in Chicago I am still feeling very spoiled by this. 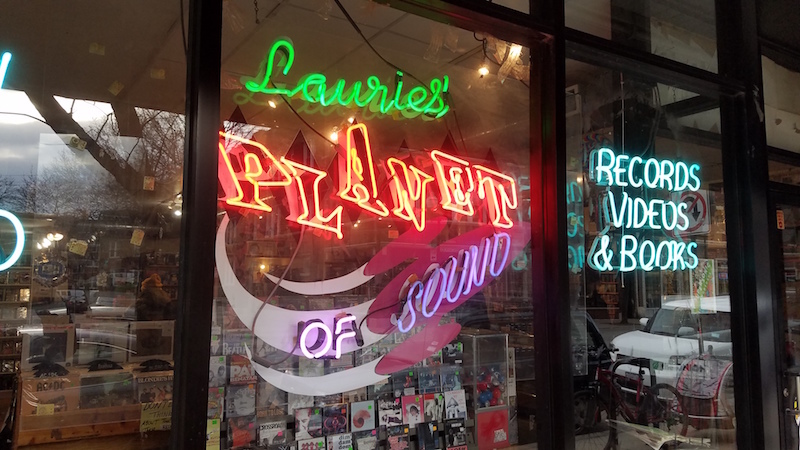 So naturally when I decided to start doing vinyl-based sound art, Laurie’s became a go-to place for me. I like the people who work there, it’s a shop with a lot of character, and I always find unusual vinyl records there. Mostly though, I go in, do my own research, and take what I can find. But today, Thursday Feb. 16 2017, I needed just a bit of help. With fun results. “I’m looking for a really crappy copy of The Joshua Tree.” Yes, THAT Joshua Tree, the 1987 release by U2 produced by Brian Eno and Daniel Lanois, recorded by Flood, and album photography by the legendary Anton Corbijn. Which got laughs, questions about why I needed a crap copy of an RIAA Diamond-selling record (the highest record sales award you can get..Gold, Platinum, Diamond, lots of money). I explained to them what I’m about to explain to YOU, except this is not the condensed version. Earlier in the day, I spent some time in an isolation tank, floating in pitch blackness, having some zen experiences, contemplating the void, getting salt water in my eyes, and hearing my own blood rushing through my ears with a bit of tinnitus thrown in for good measure. OK, more than a bit. I got out, showered, and went home to do some research and try to get some inspiration for a new sound art project to work on. I sat down at the computer and started thinking about that isolation tank. About how black it was. As black as the dead wax on a vinyl record, except not as reflective. As in, not reflective at all. Thinking about dead wax and vinyl records and sound art all together started making me contemplate Negativland for some reason. I have no idea why the name popped in there except that in relation to sound art, they have always been front and center in my mind as a group of people working on things that obsessed them even when it had the potential (fully realized) to get them into big trouble with corporate media. That controversy happened when Negativland released some material featuring appropriated sounds from DJ Casey Kasem and U2’s “I Still Haven’t Found What I’m Looking For” from the Joshua Tree record. This is all documented by Negativland in Fair Use and is generally fascinating. Then I started thinking about how one could revisit this controversy, paying tribute to Negativland’s work with one hand and poking the goofy lumbering corporate media they had to battle with the other. But, it must be stressed, without reinventing Negativland’s wheel or breaking into their wheelhouse, so to speak. So I decided to make a little pilgrimage to Laurie’s Planet of Sound to see if I could first find some source material-preferably The Joshua Tree-and go from there. My goal was to find a beaten-to-death copy of The Joshua Tree, one with a lot of surface noise, skips, and age-related wear of the worst kind. Something that looks like the dog took it out to the back yard and buried it. And then dug it up again and took it surfing. But Laurie’s likes to stock records that do NOT resemble this, so I was out of luck-even after squatting down and dealing with the knee-destroying Fifty Cent Bins. As in, records for sale at the incredibly high price of fifty cents, not bins crammed full of recordings by Fifty Cent. I had set some parameters for this little project on my walk to the record shop. The rules for this art project are that my source material must be purchased from the local record shop, must be a U2 record on vinyl, and most important of all, the use of my source material cannot contain ANY MUSIC from the record. You read that correctly. This sound art project investigates the intersection of copyright, physical media, the ephemeral nature of that media, musical history, and appropriation. Which is why this project, Dead Wax and The Sounds Of Silence, uses samples from the album’s runout grooves, the spaces between songs, even silences found within the album itself. These are recorded, edited, manipulated, mutilated, and otherwise altered to create a new, transformative work. I suppose it’s fair to say that this project also riffs on John Cage’s 4’33, which I include below at the end of the post (while this clip lasts, it may be yanked at any time from the poster’s account via the whims of YouTube) for reference. This project is ongoing, I was just pretty eager to share all this before memories get too blurry about what happened on the day of the record store trip. What ultimately happened at Laurie’s? I had to settle for a copy of the U2 vinyl record, Wide Awake In America, which features Lanois/Eno. Sure, it would be more historically accurate and fun to manipulate the silences of The Joshua Tree in general, and “I Still Haven’t Found What I’m Looking For” in particular. But for now, source material has been obtained, and the manipulation begins in 3…2…1. Updates and progress reports to follow.